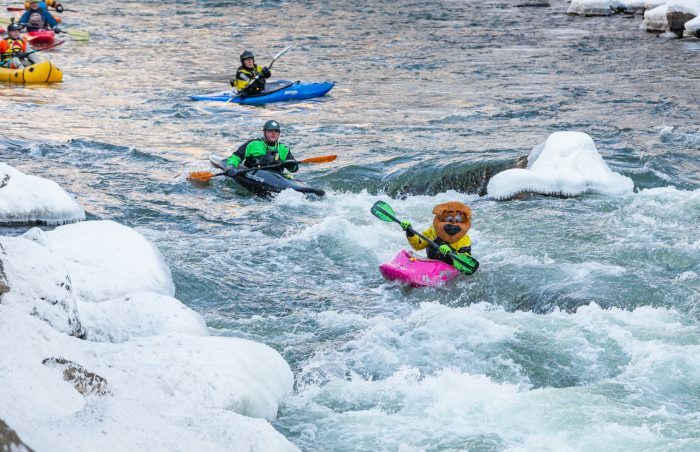 Remember shrinkage: Revelers celebrating their New Year's paddle on Shoshone. 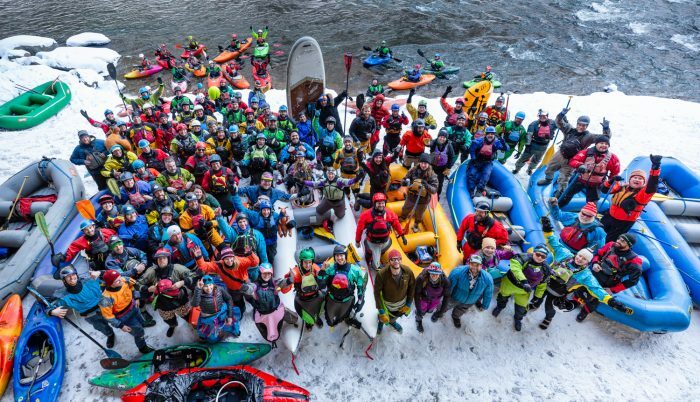 More than 120 paddlers kicked off the New Year in their kayaks for a freezing float down the Shoshone section of the Colorado River near Glenwood Springs, Colorado. “This year it was 17 degrees at the take out, and colder at the put-in, but a lot of people still turned out,” says Jackson paddler Peter Holcombe, who drove up all the way from the Southeast with his wife, Kathy, and daughter Abby, to partake in the polar paddle. The event isn’t for the faint of heart, and like all winter paddling, offers its challenges and dangers, requiring proper apparel. This year there were at least four swims, including one person who ended up on the wrong side of the river from his kayak and the takeout. A safety raft towed him back across. “Winter paddling is all about having proper gear: gloves or mitts, lots of insulating layers and a proper dry suit are all mandatory in this arena, otherwise you are just putting your self and others at risk,” says Holcombe. When all was said and done, the revelers celebrated with hot chocolate and heaters at the take-out, getting a leg up for 2019 on most other paddlers in the country.